The Fraxel SR1500 laser machine represents a huge step forward for fractional laser skin resurfacing, and SunrayLaser.com has this model for sale at an affordable price. The Fraxel SR1500 laser system is far more precise and predictable than previous fractional laser systems, and it features an added safety system that will not allow it to operate unless the handpiece and safety tip are in contact with the skin. The Fraxel SR1500 model features a 1550 nm laser along with Fraxel’s exclusive Intelligent Optical Tracking System that self-adjusts based on the operator’s hand speed and a propriety software program that helps determine the ideal spot size to use. With up to 30 Watts of power, the Fraxel SR1500 can treat patients faster and more comfortably than any other system. 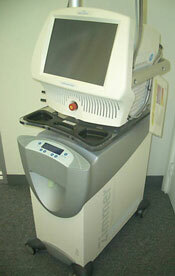 Contact us today for a low price quote on a pre-owned Fraxel SR1500 laser system. If you think that the price of a quality fractional laser system is out of your reach, you need to check the low prices offered by SunrayLaser.com. We have used Fraxel SR1500 laser systems for sale at up to 60% or more off the new retail price, and we guarantee you will be satisfied with your purchase. We strive to make the buying process as easy and fast as possible, so we are happy to provide a free price quote on a used Fraxel SR1500 laser machine with no obligation. Simply fill out the contact form below and a member of our customer service team will respond promptly.